Piece of Paradise in Islamorada Home is perfect for everyone wanting to vacation in the Florida Keys without having to spend a fortune doing so. We have fabulous rates for weekly and monthly rentals. This beautiful 4 bedroom/ 3 bath waterfront home is located in one of the finest neighborhoods of Islamorada- Venetian Shores. It is just 1 minute away from the world famous Holiday Isles (Tiki Bar). Islamorada, Florida is a town that is comprised of several coral islands in the Florida Keys. Nearby are Everglades National Park, a coral reef, and the Florida Straits, foundations for oceanic wilderness that are perhaps the most appreciated in the world. Here you can experience maritime recreation at its best, explore hidden natural trails, and dine on local seafood that is as fresh as it can be. 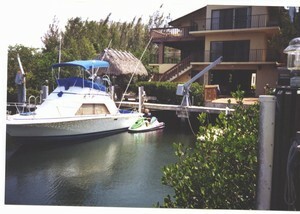 When you stay at Islamorada rentals, it is as if you can call the Keys home even for just a short time. Whether you stay at Islamorada vacation rentals on Plantation Key, Windley Key, Upper Matecumbe Key, or Lower Mattecumbe Key, the sense of being in paradise is just the same. Indian Key and Lignumvitae Key are also part of the chain. Chances are you'll have some kind of watery view when you reside at Islamorada condo rentals, but one will certainly not be far. Family outings for swimming, fishing, or even snorkeling and scuba diving are never far away, adding to the convenience of Islamorada vacation rentals and there proximity to everything the islands have to offer. Highlighting the experience of any stay in the Keys is the freshly caught seafood. Dining is a pleasure rather than a chore here, as everything from bistros and cafes to small tiki bars serve world class seafood delicacies. The area is so perfect that it is a destination for many weddings, but any family can enjoy the convenience and experience of staying at this tropical destination, especially at Islamorada vacation rentals. You can also bring home seafood from area shops, and cook it on the stove. That would never be possible in a motel room, so your options for dining or just staying in add much to the experience. The opportunities to go boating, partake in watersports, or go fishing are seemingly unlimited in Islamorada. There is also golf as well as theaters and art galleries to visit. Local artists are just as infatuated with the area as you are, and take to their artform to represent local views with majestic paintings. From spas to watching spectacular sunsets over the water, you'll find relaxation here is more prolific than anywhere else. When you stay at Islamorada condo rentals, you may never want to leave, especially when everyone including the kids has space and privacy in such a beautiful setting. Islamorada is made up of small islands, so Islamorada rentals can get booked up fairly early. It may be necessary to book a reservation for your family vacation far in advance, but the experience and savings are well worth the effort. You can relax your body and mind on this island retreat more than almost anywhere else, and the convenience of Islamorada vacation rentals provides advantages that will make your time memorable and worry free. All may feel so comfortable that neither the adults nor kids will ever want to leave. Interested in More Islamorada, Florida ? Check out nearby Cudjoe Key , Key Colony Beach , Key Largo , Little Torch Key , Marathon , Miami , Miami Beach .